Organisation expert Marie Kondo is back and spreading the life-changing magic of tidying up in a new Netflix series – I don’t know about you, but I’m hooked! Since releasing her first book in 2011, Kondo has been inspiring families, couples, individuals, workplaces and professional cleaners (like me) with her decluttering techniques. A tidy home or work space has the power to de-stress, renew energy and rejuvenate – a tidy room really does mean a tidy mind. And, with spring just around the corner, what better time to start thinking about a thorough clear out and fresh start? But knowing where to start or mustering up the willpower to tackle that drawer/cupboard/spare room/loft/garage can be a daunting prospect. Luckily, I’m here to help, so let’s begin by exploring how we can adopt Kondo’s techniques in our everyday, busy lives. 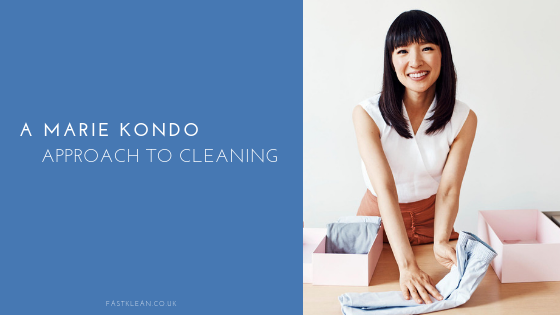 Kondo first detailed her KonMari Method in her book The Life-Changing Magic of Tidying Up. This approach to tidying involves putting your possessions into categories; clothes, books, papers, miscellaneous (or komono) items and sentimental items. Once categorised, take an item and ask yourself “does it spark joy?”. If not, thank the item for its service and then let it go. 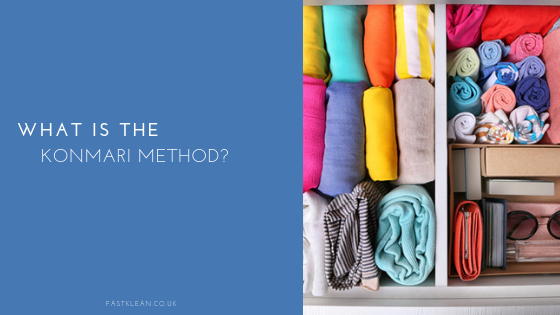 The KonMari Method is a form of mindfulness. The physical process of decluttering is also a decluttering of the mind, and the key here is to take time in assessing how items in your home make you feel. The method also allows you to let go of the guilt that sees us holding onto items unnecessarily and falling into the trap of hoarding; the faded Christmas tree decorations that our now grown-up children once made, for example, or those impractical champagne flutes given as an anniversary gift by the mother-in-law. Thank these items for the joy they once gave and then bid them farewell. I’m feeling lighter already! Whether a habitual hoarder or always feeling a bit disorganised, tackling tidying up takes time and effort so make sure you’re committed. Visualise the lifestyle you will have in your new tidy home. This is your motivation for embarking on your tidying journey and your inspiration to keep going. Put simply, recycle, give to a charity shop or eBay unwanted items. Resist the temptation once you’ve sorted through a category of your possessions to store those items that don’t “spark joy”. This is repeating the hoarding behaviours. You need to let these items go in order to give the possessions that do “spark joy” their space in your home to breathe. When beginning the process of tidying up, it can seem logical to work from room to room. But in doing so you don’t get a true view of all of your possessions and tend to simply move items around the house, circulating the clutter rather than tackling it as a whole. It is therefore imperative to categorise your possessions. The order to categorise and assess your possessions is to start with clothes, then books, papers, miscellaneous items, saving sentimental items until last. The key here is to focus on what does spark joy. You are approaching tidying up from a proactive and positive mindset, you have decided to keep an item because it brings you joy; rather than concentrating on the negative and what you are throwing away. Once you have a home where you are surrounded by items that spark joy, you’ll want to keep up this tidying technique and take care of your new sanctuary. A decluttered home is just the first step to the new, calmer you. To maintain that level of serenity and clarity of mind, you’ll also want to ensure it is a clean home. You’ve come this far after all. At FastKlean, not only can we support you every step of the way in your decluttering journey, but we can also help you maintain your home with various cleaning services. Ready to get started? I’m with you.